Paper napkin applique or decoupage is a fun technique to learn for kids, and allows adults to create such great ornaments. Using scissors, cut out a design from a napkin. Paste up the area where the design will be fixed with a paintbrush. With a brush well loaded with paste, fix the motif, pressing on the center first then the sides. Useful to know! Carefully cut out the design you want to stick. Peel away the second layer of paper. Remember, some napkins are 3-ply, keep only the decorated sheet. The sides of the wooden box are first worked with a wood chisel to remove the corners. Apply light green paint to the sides and top of the box, dark green to the upper projection, the base and the side of the lid. Apply white paint with a cloth. On the light green background, keep on until you have a non-uniform effect. On the dark green, therefore the areas worked by chisel, the white will show up the different textures and depths, creating a marbled effect. Using a plastic rule or the side of a stencil (wash after each use), paint a light green line down the projecting upper piece. Stick on the paper motifs you've cut out. On the projecting piece, cover the green line with ivy 'leaves' at various points. 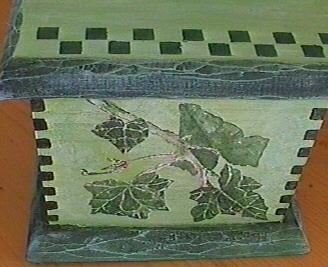 Using a stencil, paint on dark green squares. So this box can be used for storing food products, we've left the inside untouched. After dusting the box, paint all over (including the inside, for when the box is opened up...) in the one color. Apply white paint using a cloth and smudge immediately once applied, again with the cloth. Carefully cut out motifs from paper napkins. Try out various positions for your cut-outs before pasting. Glue the cut-outs, pasting from the center out. Decorate the box sides with white paint and a small stencil or paintbrush. Varnish the whole object at least twice more.